Ferren, a 61-year-old inventor and cofounder of tech design firm Applied Minds, came up with the unique camper van with his young daughter in mind, wanting her to explore the world safely after he is not around. Built with no detail spared, The Kiravan boasts a beautiful custom kitchen, booth-style dining area, high tech on-board office space, storage space, sleeping areas and even a tented penthouse for Kira to relax in. The gigantic RV stretches to 31 feet long and 10 feet high, with pop-up areas for expansion when not on the road. The six-wheeled vehicle is controlled in a sleek cockpit that looks like a mission control center, complete with a vibration reducing chair and a panel of touch screen monitors and infrared cameras that can check traffic and terrain conditions ahead. When stocked, the vehicle can sustain a family of three for two or three weeks, and travel for 2,000 miles without resupply. Aside from extremely fancy camping, the Kiravan is a million-dollar off the grid survival vehicle. The usual - the one percent and their expensive toy creations. Inhabitat, is this about smarter and more sustainable future? Geez... Charlie & Tim.... have to made derogatory comments because you envy what others have! If a millionaire wants to spend his money on a hi-tech RV, which creates jobs for others during the construction process (AGAIN, using HIS money, HIS money), then it should be just fine... instead, you foam with envy! Good day you socialist people! How rich people think they can protect their offspring in the future, apparently. Ever thought of just putting their hard 'won' mega bucks into fighting climate change in stead? Didn't think so. Oh hang on - it's got an "eco-friendly toilet"! As you were then. Ferren, a 61 year old inventor and cofounder of tech design firm Applied Minds, came up with the unique camper van with his young daughter in mind, wanting her to explore the world safely after he is not around. The gigantic RV is 31 feet long and 10 feet high, with pop-up areas for expansion when not on the road. 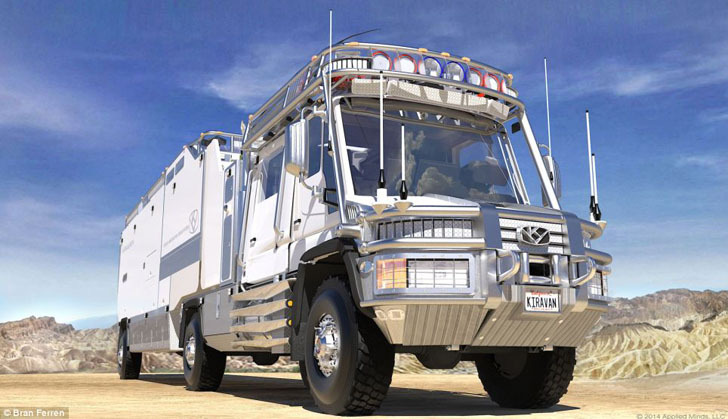 Aside from extremely fancy camping, the Kiravan is a million-dollar off the grid survival vehicle.